The Red-breasted Goose is the smallest of the northern geese and the most boldly patterned. 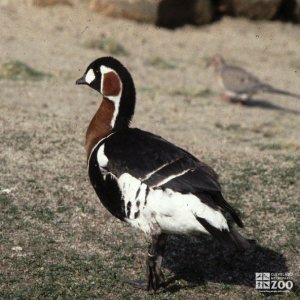 The genus name, Branta is from the Anglo-Saxon brennan, ‘to burn’ and refers to the reddish-brown color. The species name ruficollis is from the Latin rufus, ‘red’ and collus, ‘the neck.’ The coloring of the upper and lower plumage shows a combination of black and white. In particular, there is a stripe or band on the sides and a conspicuous under-tail and a white mark on the cheeks. The neck and breast are rich reddish brown and are separated from the black under-parts by a white stripe. The small delicate bill, legs and feet are black. Sexes look alike, but immature birds have a paler color. The length is 20 to 22 inches and the weight is about 3.5 pounds. The wingspan is 48 inches. The range of the red-breasted goose is northern Asia and eastern Europe. The habitat of the red-breasted goose includes coastal tundra and grassy steppes. Red-breasted geese often flock with white-fronted geese in the winter when it feeds on spilled grain and sprouting wheat shoots. While migrating it will eat the bulbs of wild garlic. These winter flocks are very active in feeding, and quarrels are frequent. In the summer it grazes. The bird shows two distinct types of “threat” against perceived enemies: 1) a lateral threat in which the head is erect and the neck feathers are elongated and vibrated vigorously, and 2) a more extreme threat involving a forward display during which the head and neck are pointed toward the opponent and held close to the ground while the head is shaken occasionally in a rotary manner. These birds are very calm as far as man in concerned and allow close approaches to their nests. Some photographers have been able to get as close as 3 feet without the need of a blind.The population of this species is quite reduced, and the present flock is under 20,000. Red-breasted geese breed between their third and fifth years in captivity. They arrive on the Siberial breeding grounds in flocks of 3 to 15 birds, usually by mid-June. The breeding habitat is situated in grassy steppes along rivers and in the coastal tundra. The nest is made in a shallow hollow on the ground and is lined with plant matter and down. The single clutch each year is incubated solely by the female while the male acts as sentry near the nest. He also feeds her during this period. Fledging takes 6 weeks. Many nests are built near the nests of raptors such as peregrine falcons and rough-legged buzzards.